Dirty Trail Shoes (DTS) first interview with a badass runner, friend and colleague, Heli. Heli has been trying to Boston Qualify (BQ) for sometime but with his young age and gender a 3:15 is a real tough bar to reach. His last BQ attempt was LA Marathon back in March of this year and he came in 3:35. However, after doing more strength training, loosing 5 pounds he killed his goal time of 3:10 with a 2:58:35. Here is how he smashed his goal. DTS: You’re training for the Azusa REVEL Canyon City Race. Is this your 1st? HC: Yes, its my first Azusa race. DTS: What made you decide to do it? HC: A friend told me about it and said it was a very fast pace course due to the downhill. DTS: Did you follow a training plan or work with a running coach or are you just winging it? 1. lean forward and allow the natural force to help you run downhill. 2. Incorporate lunges and squats in my workout routing about 2 -3 times a week to help strengthen my knees for downhill running. 3. Try to get a good night rest and allow my running muscles to recover. 4. Go out and enjoy the run and try to have fun while running. DTS: What’s your current pace? HC: Average was 6:49 per mile. DTS: Do you have a time goal? Most runners have 2; one that they would love to accomplish and one that they would be happy with. Or do you just wanna finish? 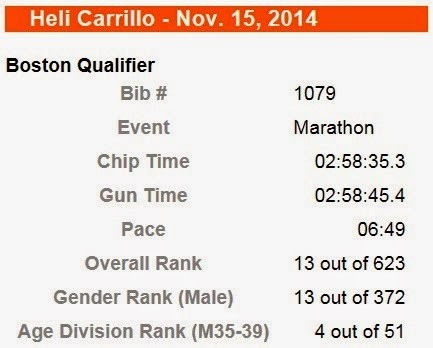 HC: My time goal was 3:10 since that is my Boston qualifying time for my age group. DTS: Are you running this marathon alone? HC: I ran the marathon with other friends but we each have our own pace. DTS: Do you belong to a running group? HC: Yes, I am running with USA Marathon Training on Saturday mornings. DTS: Marathon training requires a lot of time and dedication. Did you have to make sacrifices? How did you handle that? HC: Yes I did spend lots of early mornings getting my training runs done. DTS: What was the best thing about training for this marathon? HC: I really enjoyed running in different places durring my training as per recommendations from other fellow runners. DTS: What was the worst thing about training for this marathon? HC: I feel that I lost a lot of sleep due to late night commitments and having to get up early. DTS: Any crazy training or running stories? HC: My longest training run of 21 miles took me about 3 hours to complete due to the constant water stops I did. DTS: Have you experienced any injuries during training? DTS: You trained for this race during the summer. How was that versus the current cooler temps? Which is harder? HC: It felt about the same for me since most of my runs were done in the early mornings. DTS: Did you train solo or with friends? Which do you prefer? HC: During the week I trained with some friends but in the weekends I ran with my running club. DTS: What has this experience taught you about yourself? HC: That we can do anything that we set in our minds to do. DTS: Longest Training Run to Date? HC: I had a 21 mile training run that was done partly on the road and partly on a trail. DTS: How many miles did you typically run in a week? And what was the most miles done in a single week? HC: I averaged between 35 to 45 miles a week. DTS: Is there anything you feel you need to work on? HC: I can work on pacing myself so that I can have a strong finish. DTS: Got any Advice/Tips about marathon training you wanna share? HC: Running alone is great but including body weight exercises like squats, lunges and core exercises are a plus to helping one achieve their goal. DTS: What is your fluid and fuel strategy for running a fast marathon? HC: I began to drink fluids at the first water station but since it was a cool day I started with small amounts like a fourth cup of water if that. Every other water station I will take the GaterAid/PowerAid for the electrolytes. I had a bowl of oatmeal before the race began then I had an energy gel every 6 miles into the race. At about mile 20 I had a energy gel with 1 shot of caffeine to help with the last 6.2 miles. DTS: You ran a 3:34:31 at the LA Marathon in March of this year. How did you go from a 3:34 to sub3? Are you going to bottle and sell your secret? HC: I feel that I trained a little harder and included the body weight exercises that I mentioned above. It also helped that Azusa Revel race was a fast pace downhill race which gives the advantage of getting a better time. 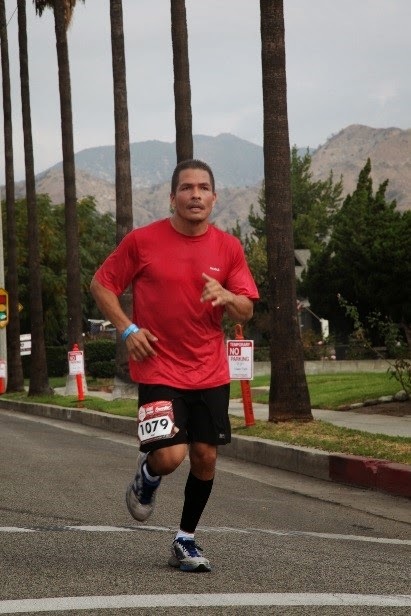 Oh, and I also lost 5 pounds between LA marathon and Azusa Revel which allowed me to run a lighter and faster. DTS: Congratulations on your BQ and PR run!